If Jamaica is your vacation destination, then scuba diving in Montego Bay is one of the must do that needs to be included in your agenda. With breath-taking attractions both at the top and below the waves, is a plunge worth taking. The weather is warm and tropical year round with temperatures of about 78 to 85 degrees. Montego Bay is the second largest city and the capitol of St. James Parish. The city is well connected by road, air and sea and is a famous tourist destination. They are many scuba diving destinations in the world but this is one of the best for someone who is looking for affordability. Vacations to Montego Bay is characterized by the right weather and water temperature for a wonderful scuba experience. Scuba diving has become one of the greatest recreational sports all around the world and can even be a profession. Here is your resource for Scuba diving equipments. Professional staff and boats are fitted with modern amenities for your diving expedition, and are provided year round by many of the resorts and operators. Groups are usually small and are guided by qualified experts to enforce strict safety laws. Operators ensures you that your diving experience is safe but still adventurous. The underwater world in Jamaica is filled with life and vivid colors with coral reefs and canyons and grottos etched along the walls. You have diving visibility ranging to about 100 feet and the topography of the underwater world which includes caves, overhangs and excellent coral reef patches offer a visual treat for you to enjoy. The dive sites are nearer to the shores along with the huge number of professional operators act as an added advantage in cost and time compared to other scuba diving sites. 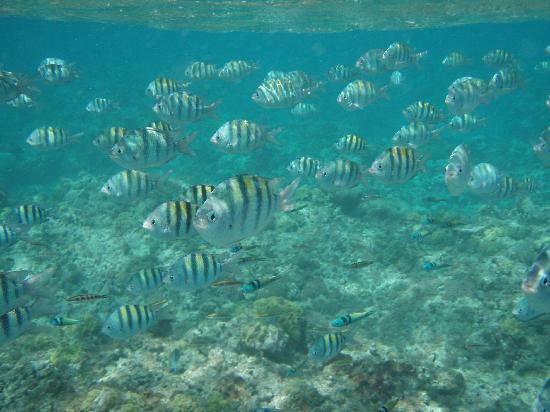 The Montego Bay Marine Park is an underwater educational adventure about the ocean. The area is great for diving and is known for its special rainbow colored sponges and the huge schools of Creole wrasse. Your diving experience is increased multi-fold when you swim through the huge caves that penetrate the coral reefs near the Airport Reef and Windowmaker's Cave. You will enjoy the entire Montego Bay shoreline that is filled with underwater wonders ranging from uninhabited mangroves to wrecks of a 1944 American navel ship. The area has a wide variety of fishes to turtles, dolphins, eels and black tip sharks and many different marine species. Snorkelers will find areas of great excitement in the Seawinds Peninsula, Doctor's Cave Beach and Buccaneer Beach. Doctor's Cave Beach and Buccaneer Beach are perfect for small groups looking for glass-bottom sailing. Sahara De La Mer Hotel is an ideal place to get to Unity Hall, another wonderful site for snorkeling fanatics. The area provides excellent facilities for divers and snorkelers. And, diving in Montego Bay comes in packages that do not cost you more than US$80 to $100 on average. So scuba diving in Montego Bay is a trip worth taking. It not only provides diving pleasure at an affordable price but, also a memorable experience that will last for a lifetime.